As we all know, YouTube is a popular global-sharing website which allows users to view, rate, upload and share videos, including music videos, video clips, TV clips, movie trailers, and other contents like short original videos, educational videos and video blogging. 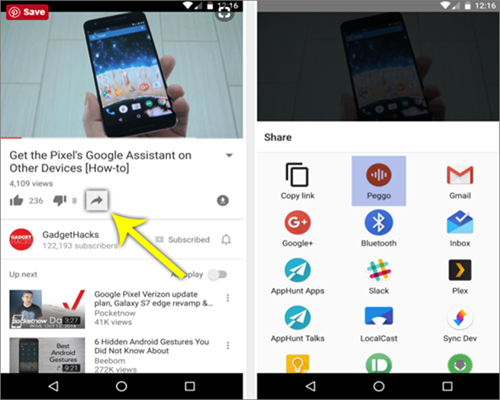 Now you can even share Youtube videos at specific time. However, Google doesn’t allow users to download music or videos from YouTube to Android directly, which is considered as piracy. 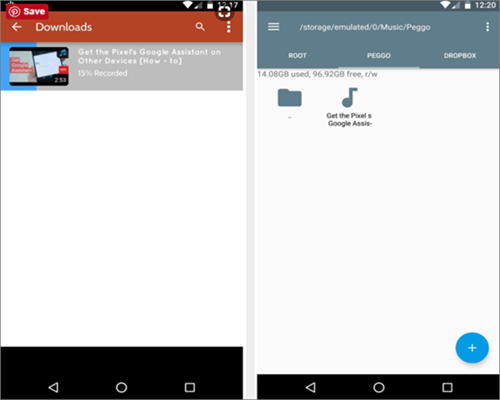 If YouTube is your key source for streaming music and you don’t want to spend bucks on it, you’ll need to take the matter in your hands – a YouTube video/audio downloader for android. Here the role of Videoer, TubeMate, Peggo, etc come into play. 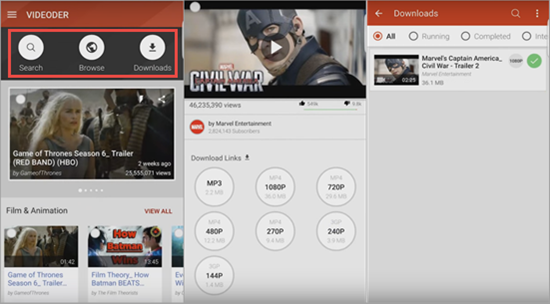 With one of these YouTube downloader apps, you can download all your favorite music and videos from YouTube to Android at one go. You can download much YouTube music to Android at the same time while browsing. You can download any videos as MP3, 4K, 1080P, 720P, 480P, 240P, 144P and in 60fps. This youtube music downloader for android supports more other music and video websites, like Facebook.com, Instagram.com, Whatsappdaily.com, etc. No matter when you download or play the music, the annoying ads won’t turn up. This app allows to download several pieces of music at the same time. You will be able to save the downloaded music not only as high-quality video but also as audio. During the process of using this app, there is no ads annoying you. Only supports downloading music from YouTube and DailyMotion for your Android. You can download multiple music and videos simultaneously as you like. With this YouTube music Android download app, you can search for any mp3 music or videos to download them. It allows to download mp3 music for free from all websites without limitations. There will be some ads to bother you while browsing pages of this app. This app can preserve the original quality of the YouTube music at a high speed and it allows multiple downloads simultaneously. This app can save and play the downloaded files as videos or music to satisfy your certain needs. TubeMate only applies to YouTube, so you can download music only from YouTube to Android, not from other video websites. Ads will be displayed after you install the app on your Android. You can download more than YouTube music to your Android as you want. After you install the app on your Android, you can browse and download without ads. This app only saves the audio track for YouTube music on your Android. You can only select one of your favorite music and click the share button to download the soundtrack. 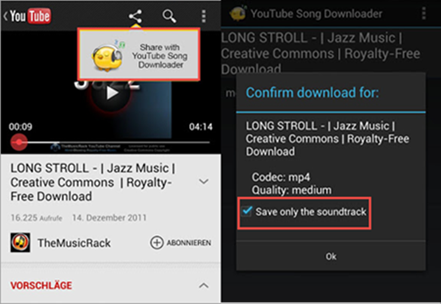 It can support YouTube to Mp3 converter for Android to rip audio from YouTube videos. Peggo can automatically remove unwanted silence from the beginning and end of videos so you can get Mp3 with good stuff. And you never have to reach for the volume dial between Mp3s because Peggo normalizes every recording to the same and comfortable volume. Peggo provides a dedicated storage space “Music Directory” for these Mp3 files in case of confusion with ones form other sources. Here we take Peggo as an example, and show you how to quickly install Peggo app and start downloading YouTube audios or videos on Android. Tip: If unfortunately you lost your video or audio files on Android, please remember to stop using your phone and use this Android Phone Recovery to recover deleted videos and audios from Android phone. As you cannot find Peggo in Google Play Store, you’ll have to make sure that you’ve enabled the “Unknown Sources” option before you install it. Plus, you need to install the APK files to your Android device. Then click on the “Download Complete” notification and when a prompt screen appears, press “Install”. With this YouTube music android download app installed in your device, downloading a YouTube video or ripping a Mp3 from YouTube video is very simple. All you need is just to find a video in your regular YouTube app. A share button will appear beneath the description, and tap on this “share” button. Lastly, choose Peggo from the list. 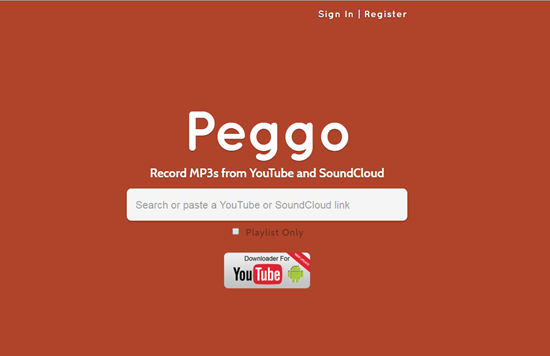 After you share the video to Peggo, the app will start downloading an Mp3. 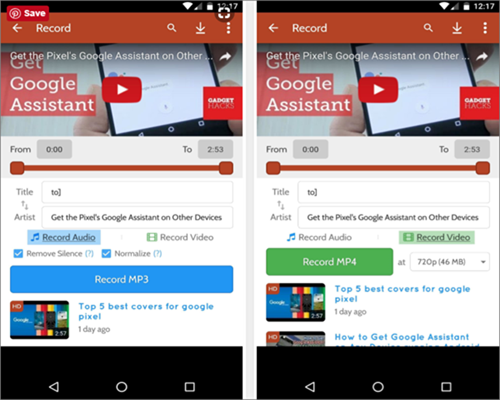 Tap on the option “Record Mp3” to get a copy of the audio track from the corresponding video, Peggo serving as a YouTube music downloader for Android. Here, you can also find options for you to adjust sound and other things. For downloading the actual video, you need to select the option “Record Video” instead, then choose your desired resolution and click on “Record Mp4”. Once you tap the record button, the Mp3 or video will automatically start downloading. But always make sure that you don’t put yourself in trouble for pirating content by keeping yourself aware of the fact that some videos on YouTube hold copyrights. As the Peggo has a blazing fast speed, you needn’t to keep the app open in the foreground. It will download the files in no time either way. Once the downloading is complete, you can find your recording in the Peggo folder inside the “Music” directory either on your SD card or in internal storage. And finally, it will start playing in any music or video app on your device. 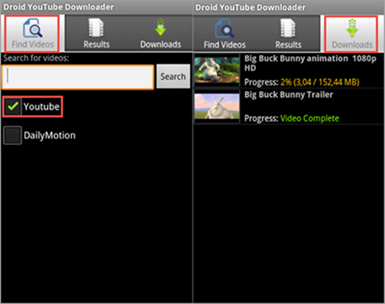 Having had a general understanding about these YouTube downloader apps for Android, you must can’t wait to have a try. Please leave your message in comment area below after your experience!